Field amputation is not thought of very often, and for good reason. It is unpleasant, uncommon, and not very safe. I’m going to spend the next few days on this topic, starting with some of the facts. An informal poll of trauma surgeons at the recent American College of Surgeons meeting in San Francisco showed that only 5 had ever been called to do a field amputation, and only 2 had actually done it. Uncommonly performed procedures are always problematic. It is extremely difficult to keep skills sharp and to remember the protocol (or even where to find it). Furthermore, these procedures are prone to error and pose considerable risk to all. Reference: In-Field Extremity Amputation: Prevalence and Protocols in Emergency Medical Services. Prehospital and Disaster Medicine 11(1):63-66, 1996. I did get a lead on a decent video of an emergency thoracotomy that combines most of the principles I laid out last week. It shows a nicely done thoracotomy with exposure of the heart. Aortic crossclamping is not performed, but overall it’s pretty good. All narration is in Thai, so many of you may not be able to follow the conversations. Nope. Sorry. The two don’t mix. I just finished attending the American College of Surgeons meeting in San Francisco, and now I’m moving up to the Napa Valley for a few days. However, enjoying the sights, food and wine here is not conducive to writing coherently. So I’m taking a few days off to concentrate on other things. I’ll return on Tuesday with several days of material on field amputations. I’m also teaching several sessions at the TCAA Trauma Director course and their Trauma Performance Improvement course. I’ll be tweeting some of the more interesting content as I sit in on some of the others’ sessions. Talk to you again on Tuesday. Cheers! Finally, a consensus report has been finalized by the Institute for Clinical Systems Improvement (ICSI) regarding bleeding in patients taking dabigatran (Pradaxa). I’ve written about the special problems posed by patients who are injured while taking this drug and related ones. I’ve also provided some management algorithms for consideration while complete ones were crafted. Well, here they are. A workgroup of experts from hospitals here in Minnesota were convened to consider and provide a framework for managing these patients. A document was released recently to help guide their care. Evaluating bleeding. In trauma, this will generally involve CT scan. Click here to download the official document from ICSI. Obviously, there’s a big knife in this image, and it appears to coincide with our patient. Remember, you can’t tell the relative positions of objects in the z axis in a two dimensional radiograph. However, you know that it is not on top of or under this patient, because there is an obvious hemothorax. First, this patient should have been a trauma activation, since there is a penetrating injury of the chest. The first decision point is based on vital signs: is the patient hemodynamically normal? If not, do the essentials quickly (quick exam, lines, blood draw for blood bank) and move to the OR. The quick exam is important, especially of the back, since you may not see it for the next few hours and additional injuries there could be trouble. If the patient is stable, then it’s time to do the essentials and figure out what you are going to need to do in the next hour. A chest xray can be very helpful. However, given the size of the knife and the fact that it appears to be buried to the hilt allows you to calculate the trajectory in your mind. The only question is if it went in far enough to enter the abdomen. The xray shows a moderate hemothorax and a tip that extends well into some part of the abdomen, no matter how you look at it. It has also come alarmingly close to the heart. 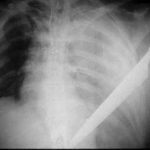 If the knife had not penetrated as deeply and was obviously only in the chest, then removal of the knife with insertion of a chest tube would be appropriate. However, in the case of this xray, the patient still needs to go to the OR. The chest and abdomen need to be prepped and the abdomen opened first. Once the knife is located, the next steps can be planned. If there is concern for the heart, the pericardial surface of the diaphragm can be opened to look for blood. If found, extension of the laparotomy incision into a sternotomy is appropriate for cardiac repair. If not, the tip of the knife should be visualized and the weapon slowly removed under direct vision. Any bleeding structures can be dealt with first as it goes, followed by any injuries to a hollow viscus.